The Cambridge Animal Alphabet series celebrates Cambridge's connections with animals through literature, art, science and society. Here, D is for Dragon. Watch out for fire-breathers among the treasures of the Museum of Archaeology and Anthropology, in Anglo-Saxon proverbs, and in fantasy literature from medieval Scandinavia to the present day. Earth, water, air and fire. If you were to pick an element that you most associate with dragons, you would probably choose the last – fire. And though the jaws of all the dragons to be found lurking in the Museum of Archaeology and Anthropology (MAA) are devoid of flames, they do speak to the immense power of the dragon to ignite cultural imagination in all corners of the globe. 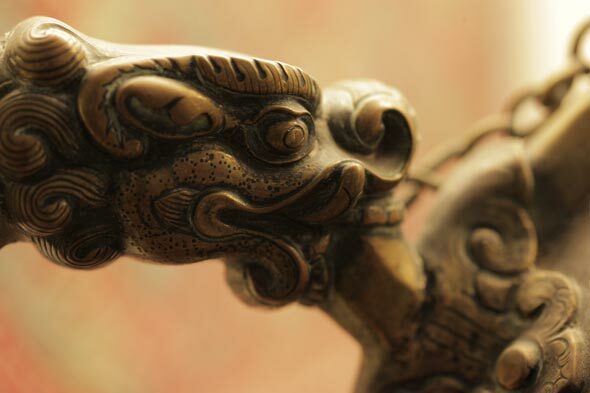 From the Anglo-Saxons of Old England, to the lamas of Tibet and the jungles of Borneo, dragons have been carved, stitched and emblazoned on countless artefacts of human creativity and endeavour. But on closer inspection, a more appropriate element to associate with these mythical reptiles may indeed be water. Sporting arguably the finest beard in the MAA, this dragon formed the fearsome figurehead of a canoe. 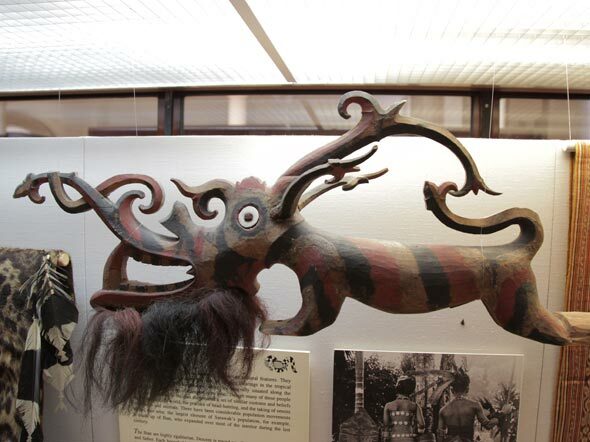 On display in the Maudslay gallery, it was found in the Baram River District of Borneo by alumnus of Christ’s College and influential anthropologist, Dr Alfred Cort Haddon, during his fieldwork expedition to Malaysia and the Torres Strait Islands in 1898. In the folklore of Borneo, the dragon is a goddess of the underworld. She protects the living, guards over the dead, and is associated with earth, water, thunder and lightning. One particular folktale tells of a dragon that guards a precious jewel on the top of Mount Kinabalu, the highest point of the island. This fellow, and his mighty fine facial hair, has been temporarily removed for conservation but will be back to take his place in the museum soon. A few paces across the gallery take you all the way from the coasts of Borneo to the former Kingdom of Derge, high in the Himalayan peaks of Tibet, and takes our watery connection in a slightly different direction. This extremely rare piece of Derge ware is an iron water bottle covered in silver and gold ornamentation and bound with brass. The hexagonal spout rises from the mouth of a sea monster at the base, and anyone looking closely at the handle will notice that it is in the form of a dragon. The dragon, or zhug, is a deity in Tibetan mythology. Influenced by the dragons of Chinese and Indian culture, Tibetan dragons are believed to have control over the rainfall and represent water. The dragon keeping a close eye on this water container was presented to Frederick Williamson, a Cambridge graduate and Political Officer of the British Raj, by the Prime Minister of Tibet in 1933 and deposited in the museum by his wife, Margaret, in 1976. 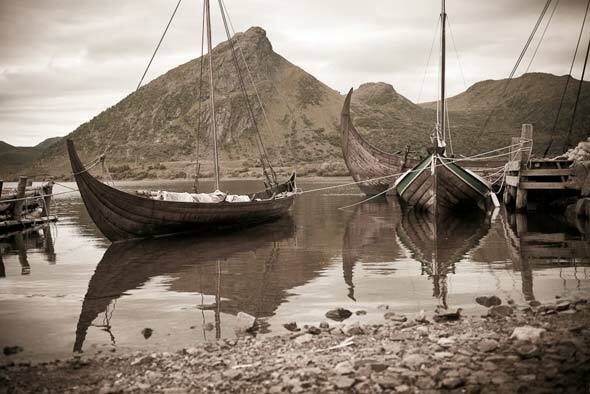 Stepping further back in time, we find dragons that were traded across the seas by Anglo-Saxons between the 5th and 11th centuries. The museum's collection of Anglo-Saxon brooches, some with dragon-like creatures engraved on the front, were among the first in Britain to have testing carried out on their garnets – decorative pieces of red gemstone. The results of this testing have provided evidence that the Anglo-Saxons were trading with India. Serpentine or dragon-like shapes were common in Anglo-Saxon art as they were easy to work into the interlaced designs that were popular during the period. Beyond just being carved on jewellery and armour, the association between dragons and treasure was particularly strong in Anglo-Saxon writing – even entering proverbial sayings such as the maxim “draca sceal on hlæwe, frod, frætwum wlanc” (a dragon must be in a mound, old and proud in his ornaments). Students in the Department of Anglo-Saxon, Norse and Celtic (ASNAC) come face-to-face with dragons in a number of courses, according to Dr Richard Dance. Probably the most famous of these is the dragon that defeats the eponymous hero of Beowulf in the epic poem’s dramatic finale. dryht-sele dyrnne ær dæges hwile. Was the hateful air-goer willing to leave there. To the well-hidden cavern ere the coming of daylight. “A major theme in heroic and epic literature is obtaining treasure and giving it out to the people – treasure was particularly important in a pre-monetary economy. Dragons, often depicted jealously guarding their hoard, represent the obverse of generosity, like a bad king figure,” says Dance. “Beowulf is the longest Anglo-Saxon poem that we know of, and it is complex, carefully wrought and evocative. It’s good poetry as well as being a good poem — a finely crafted piece of treasure in its own right. A lot of words and the way it arranges its ideas are recognisably poetic compared to Old English prose”. Dance explains that the words “draca” (dragon) and “wyrm” (serpent, reptile) are used fairly interchangeably in the poem to refer to the hero’s final foe. “When the dragon appears towards the end of the poem we see that, very early on in written culture, the fantasy fiction idea of a dragon that we have today is already formed. Looking at dragons in modern fiction you can see that our ideas of what a dragon is depend quite closely on the ways they are presented in medieval literature like Beowulf, especially via the works of authors like J. R. R. Tolkien, himself an Anglo-Saxon scholar,” says Dance. Dr Judy Quinn of ASNAC, who researches Old Norse poetry, says that Scandinavian and Icelandic poems demonstrate how productive a symbol the dragon remained for poets in the medieval period. Whether in it, or on it, or providing a useful container for it, the dragons of the Museum of Archaeology and Anthropology have a long and storied relationship with water. Which is perhaps unsurprising given how the fire-breathing lizards of our imaginations started life in many cultures and mythologies – as serpents, sea monsters, or river deities. But to find the most unusual connection between the MAA’s dragons, we need to turn to an even more essential element – tea. Medieval England, between the 16th and 18th centuries, gives us an exhibit affectionately nicknamed “Dragon in a cup”. One of the highlights of the MAA’s permanent Archaeology of Cambridge display, this piece of stained glass depicts St John the Evangelist. 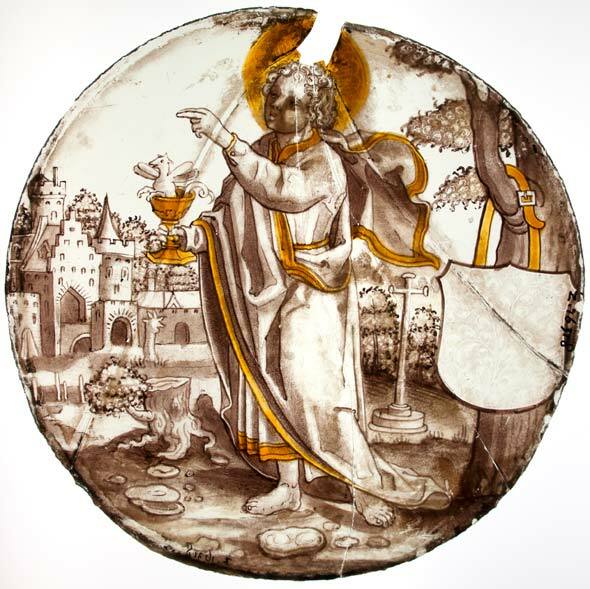 At the end of an outstretched arm, St John holds a poisoned chalice – with a tiny dragon peeping over the rim. It is a fairly common motif for St John to be depicted in this way, bearing an ominous cup of dragon – although the dragon in question looks far too friendly to be poisoning anybody. For the next stop on our tea cup quest, we’re off to Borneo by canoe again to find another intricately carved prow, known to the museum staff as George. Part-crocodile, part-dragon, George is afflicted by a condition that most tea-lovers will be able to sympathise with – he sees tea cups wherever he goes. And finally, once more to Tibet and this tea cup decorated with a long, green dragon. Donated to the museum by the Williamsons, this cup is part of a large collection of Tibetan artefacts, including a teaspoon and a folding tea table both decorated with images of dragons. 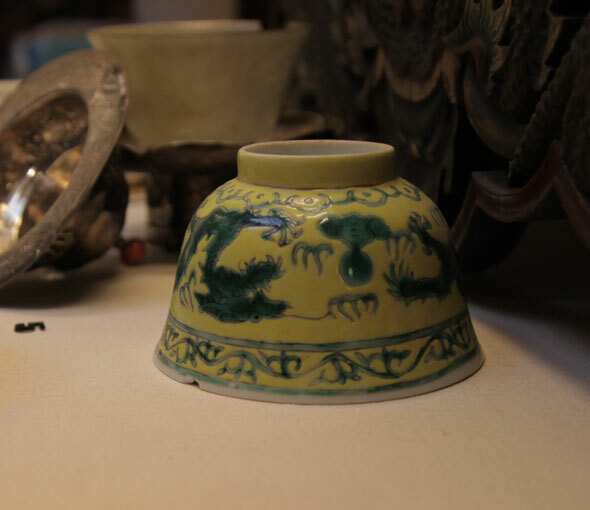 All that remains is for someone to discover a dragon using a tea cup and the MAA’s collection will truly be complete. 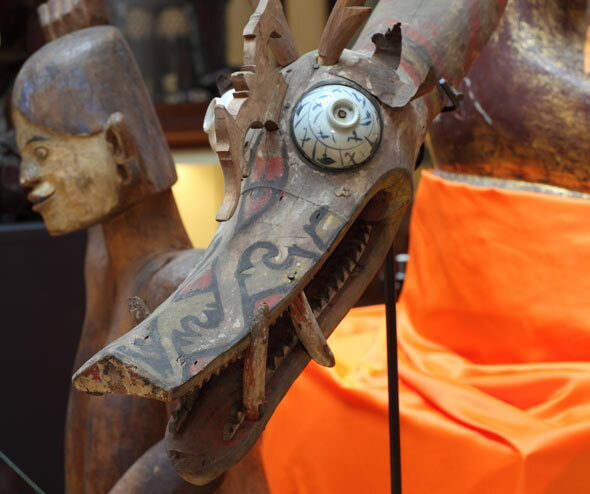 You can meet all of these dragons, and many more of their friends prowling the treasures at the Museum of Archaeology and Anthropology – from Javanese Batik cloth, to Japanese netsuke. During the summer, children can embark on their own animal adventure and try their hand at finding all of the exhibits in the museum’s Animal Safari Trail. Admission to the museum is free and it is open every day except Mondays. Next in the Cambridge Animal Alphabet: E is for an animal that takes pride of place among the medieval manuscripts in the Parker Library, and is the subject of vital conservation research in Thailand's 'Golden Triangle'. Inset images: Figurehead of a canoe, accession number Z 2403 (University of Cambridge); Derge iron water bottle, accession number D 1976.115 (University of Cambridge); Viking ships (Jos van Wunnik); Circular panel of glass, showing a saint with a dragon in a chalice, accession number Z 16318 (University of Cambridge); Head for front of canoe, accession number Z 2698 (University of Cambridge); China tea cup (University of Cambridge). Derge iron water bottle. Accession number: D 1976.115.